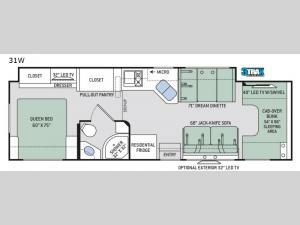 This Four Winds Class C gas motorhome features a full-wall slide that gives this coach room to include all of the conveniences of home. The kitchen is fully functional with a two-burner gas cooktop and single induction cooktop, as well as a pull-out pantry where you can keep your canned goods and midnight snacks, and as you rinse off in the 32" x 32" radius shower each morning, you will appreciate always having water with the tankless water heater. Sleeping space for seven can be found all throughout this coach on the queen-size bed in the private bedroom, the 71" Dream Dinette and 68" jackknife sofa in the living area, or the 54" x 96" bunk over the cab.